Britain's newest pay TV provider has gone live, offering low cost and contract-free access to 25 premium TV channels, plus catch-up TV. 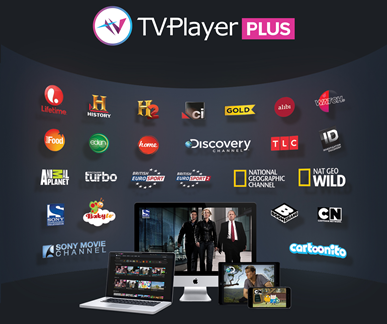 TVPlayer Plus from online TV platform TVPlayer has today come out of beta and is available for £4.99 a month on a rolling monthly basis. Viewers will be able to watch channels including Discovery, TLC, British Eurosport, British Eurosport 2, National Geographic Channel, HISTORY, Lifetime, Cartoon Network and Gold via the TVPlayer website and via an iOS app. In addition to watching live (linear) TV channels, TVPlayer Plus subscribers will also get access to TVPlayer's new catch-up TV service, available on selected channels, giving viewers a chance to watch programmes aired over the past seven days. The service will launch shortly on Samsung Smart TVs, with apps for Android and Amazon Fire coming up. An internet connection is required but unlike some Pay-TV services, there is no need for the service to bundled with phone line rental. A subscription is valid on up to three devices. TVPlayer will continue to offer a package of free-to-air channels via its website and mobile apps - a service that enables users to watch some of the UK's main channels on the go. For a 7-day trial of the service, visit www.tvplayer.com/plus. Original factual programing such as Pawn Stars, Mountain Men and Storage Wars, new dramas such as Gangland Undercover on History and British classics Hustle and Spooks and UK premieres such as Satisfaction on Sony Entertainment Television. TLC and Lifetime focus on real lives, with TLC showing Tina Malone: My New Body, Say Yes to the Dress, Whitney: Fat Girl Dancing and Cake Boss. Whilst on Lifetime, Dance Moms, Little Women: LA and UK premieres of the Real Housewives franchise are all available. British Eurosport features all of the latest live sporting events including the Cycling Road World Championships from Richmond, Virginia. Discovery Channel brings the best in factual including Running Wild with Bear Grylls, Gold Rush and MythBusters. Whilst on Animal Planet top shows include Bondi Vet and Tanked. National Geographic Channel’s top shows include T. Rex Autopsy. For children, Cartoon Network, Boomerang, Cartoonito and Baby TV are also included. The full channel line-up also includes GOLD, Albi, Watch, Eden, Good Food, Home, H2, Nat Geo WILD, Crime + Investigation and Sony Movie Channel. This is pretty good, an internet TV equivalent to what Sky charges a fortune for could be very useful, it is a very decent lineup of channels, useful on the go and could be used on Android boxes etc for the TV as well when that launches. The best line up so far, they just need to add HD, pause and rewind and they'll of cracked it!